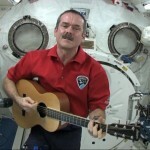 Chris Hadfield singing his song, ISS on Music Monday, along with hundreds of thousands of schoolchildren. I can hear your voices bouncing off the moon. You’d know why I want to get back soon. That day, on Music Monday, we were all just Earthlings, living together on our planet, with hundreds of thousands of beautiful voices bouncing off the moon. Chris Hadfield left Earth on Dec. 19. He’s scheduled to return to the planet next Monday, May 13. It’s been an incredible journey—for us all. Here is the Youtube video (22:53) of Hadfield singing the song, as well as a brief Q&A afterwards. And right at the very end, he floats upside-down with his guitar–just for fun. Take a look at TKN’s past articles about Chris Hadfield. 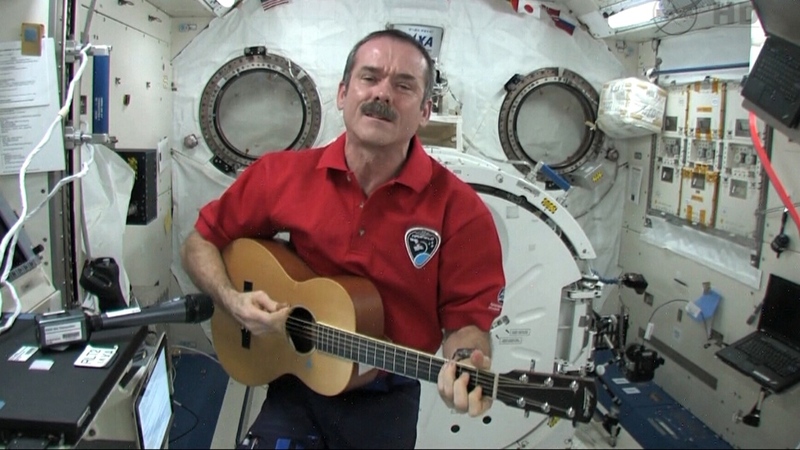 Chris Hadfield’s song, “I.S.S.” tells that the nations on Earth don’t have borders when viewed from space. He makes this point to describe the similiraties of all humankind. If you were an astronaut in space, what images would you share in your song? What would the message of these images be? This article is labelled as a “column.” How is a “column” different from a “news article”? Why do you think this piece was written as a column rather than a news story? Identify and describe the characteristics of a variety of text forms, with a focus on literary texts such as a fable or adventure story (OME, Reading: 2.1). Analyse a variety of text forms and explain how their particular characteristics help communicate meaning, with a focus on literary texts such as short stories (OME, Reading: 2.1). Analyse a variety of text forms and explain how their particular characteristics help communicate meaning, with a focus on literary texts such as a novel (OME, Reading: 2.1). A metaphor is a literary tool (device) that an author uses in order to make a comparison. Unlike a similie, where the author uses words such as “like” or “as,” a metaphor compares the subject to something else by saying it is that something else . For example, Hadfield is using a metaphor when he calls the Earth a “ball of blue” because he isn’t saying it’s “like a ball of blue” (similie); he is saying the world is a “ball of blue” (metaphor). Why does he refer to the Earth that way? How else could Earth be described?